While much of the attention to this year’s Stanley Cup will go towards the players, especially Washington Capitals’ Alex Ovechkin and Vegas Golden Knights’ Marc-Andre Fleury, much of the spotlight should be shining on the Golden Knights’ general manager, George McPhee. 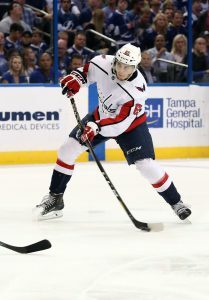 The GM, who also worked as the general manager from 1997 to 2014 of the Washington Capitals, has had a hand in more than 75 percent of the players that will be on the ice on Monday. McPhee is already responsible for putting together the Golden Knights roster from Fleury to William Karlsson to Jon Marchessault, to the often criticized deadline moves of acquiring Tomas Tatar and Ryan Reaves, both who have scored critical goals in the postseason. According to NBC Sports Tarik El-Bashir, not only has he had a hand in every player the Golden Knights have on their roster from Day 1, McPhee also is responsible for 13 of the team’s 25 players on their roster who have played in this year’s playoffs. 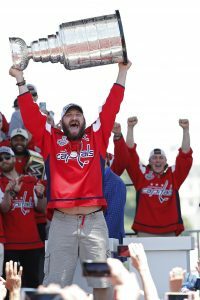 As the Capitals general manager, McPhee was responsible for drafting Alex Ovechkin (first overall in 2004), Nicklas Backstrom (fourth overall in 2006), Jay Beagle (signed as a free agent in 2008), John Carlson (24th overall in 2008), Braden Holtby (93rd overall in 2008), Dmitry Orlov (55th overall in 2009), Evgeny Kuznetsov (26th overall in 2010), Philipp Grubauer (112th in 2010), Travis Boyd (177th overall in 2011), Tom Wilson (16th overall in 2012), Chandler Stephenson (77th overall, 2012), Christian Djoos (195th in 2012), and Andre Burakovsky (23rd overall, 2013). McPhee also has a close relationship with Capitals general manager Brian MacLellan. They played junior hockey together, were teammates at Bowling Green and worked together in Washington for 14 years, making this a very strange Stanley Cup Finals. “It’s kind of a weird experience. We’ve been texting back-and-forth how strange it feels,” said McLellan on facing Vegas GM George McPhee. Nicklas Backstrom was present at the Washington Capitals morning skate today, but rotated in and out of the regular lineup. Head coach Barry Trotz wouldn’t give any indication whether the star playmaker would return tonight, calling him a game-time decision once again. Interestingly though as Tom Gulitti of NHL.com points out, Trotz revealed that Backstrom has not been medically cleared, something that was not previously known. The Capitals are in good shape against the Tampa Bay Lightning as they head into game four up 2-1 in the series. Though the Lightning were able to avoid falling down 3-0 by winning game three, they have a lot of work to do to topple the Capitals. Backstrom’s return would make that even more difficult, especially if he can jump start the Washington powerplay once again. Andrei Mironov has signed a three-year deal back in the KHL after being released by the Colorado Avalanche in March. The 23-year old defenseman never did fit into the Avalanche organization, playing just 10 games for the NHL squad this season. Mironov is technically an unrestricted free agent now that he agreed to a mutual termination with Colorado, meaning we may see him back in the NHL one day. That day will have to wait for now, as he returns to the KHL for Dynamo Moscow. The Vancouver Canucks have signed Tanner MacMaster and Jagger Dirk to one-year AHL contracts, bringing them in after amateur tryouts coming out of college. MacMaster played 18 games for the Utica Comets including five postseason contests, scoring 11 points in the process. The 22-year old forward was a dominant player at Quinnipiac University this season, and will try to prove he can keep up the early performance in his first full season of professional hockey.